Fantastic image quality, easy connectivity, built-in productivity and reliability you can count on. Buy a full set of toner in the last 60 days of each year’s warranty and you can extend the coverage for another year - for free. More details. 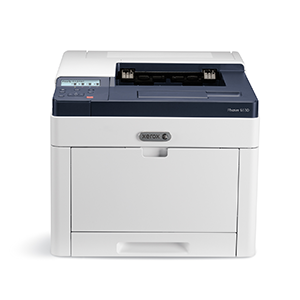 Introducing the Xerox® Phaser® 6510 Colour Printer – ready to work right out of the box. Fantastic image quality, easy connectivity, built-in productivity and reliability you can count on, at a price that won’t break the bank. Stunning resolution. Smaller toner particles translate to finer details, and with 1200 x 2400 native dpi, your printed materials will capture attention and create greater impact. Outstanding performance. Perfectly positioned to support the demands of your growing business with print speeds up to 28 ppm. Improved toner. Our new Xerox® EA Toner formulation has been reengineered for enhanced dot reproducibility and less toner waste. And because it melts at lower temperatures, it saves energy too. Automatic duplex printing on the Phaser 6510V/DN configuration makes saving paper easy, and gives your documents a professional appearance.